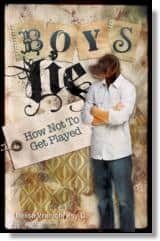 BOYS LIE How Not to Get Played is a guide book for girls and a wake-up call for their parents. It is aimed at teenaged girls with the assumption that the media and current social mores are exposing them earlier than ever to pressures for sexual involvements, and it seeks to arm girls with information that will protect their health and their futures. Guys are built to cheat. You can hook up with a friend without having feelings involved. Vranich and Eagleson expose these common untruths and suggest responses girls can make to counter them. They further offer means of correcting mistakes girls may have made in the past as a consequence of believing the lies. The book is meant to be a trusted resource for girls as they navigate the mine field of adolescent attraction and sexuality. Written by professionals, it ventures into territory many parents would never approach, filling in a knowledge gap that girls usually bridge by trial, error, and heartache. The authors primary emphasis is on pregnancy prevention and the avoidance of sexually transmitted diseases. To make their points crystal clear, they stress repeatedly the need for girls to insist that their partners use condoms during their encounters. Girls who read this book cannot fail to grasp the importance the authors place on this one preventive measure. This book is extremely frank. It is blunt in its descriptions of sexual behavior and in its use of the teenage vernacular. Parents and grandparents may be very surprised indeed to realize that the content is aimed at girls as young as ten. Vranich and Eagleson, who are in a position to know, make the assumption that a great many girls will become sexually active at a young age. They are entirely non-judgmental on this point. They do not discuss abstinence except as a possible choice to avoid harmful outcomes, nor do they dwell as much on girls emotional health as on the physical. Religious and legal aspects of teenage sexuality are not in the forefront in this book. Furthermore, they do not discuss in depth the physical, emotional, and social pressures on boys in this age group, or provide much insight into the WHYs of boys behavior. The focus of the book remains steadfastly on preventing infection and pregnancy among girls who are just discovering boys. The book contains no preaching but plenty of coaching. Many girls will benefit from reading this book, but parents probably will want to read it themselves first, before bestowing it on daughters, particularly on preteen or early teen-aged girls who may not yet understand the concepts and the language. Only a parent is in a position to know his or her daughter’s level of maturity and development. Parents may be surprised and alarmed to consider that their girls may be exposed to these sexual realities much earlier than they themselves were, but once they have been so apprised, they will be in an especially good position to guide their daughters through the dating years. In the appropriate hands, this book should do much to empower girls and young women during a time when they are very vulnerable indeed. And it may not be a bad idea for parents of boys to read it, too, as an aid to teaching responsible sexual behavior. hearty THANK YOU! to HCI Books (www.unbridledbooks.com) for providing a review copy of this book. Book Review | Big Kicks and Goal! Interesting. I would love to read this! I need this for my teenaged daughters. This book’s title is so true! I would love to have this book for my teens! Iâ€™d like to read this book. Thanks for the chance. Why wasn’t this available 20 years ago?! As a girl who’s still pretty young (21) I’d love to read this!